Magnetta. Magnetta is a resident of Grayslake and was registered for this honor by close friend Joyce Campbell. When he is home he works with the Grayslake Exchange Club on their community projects. 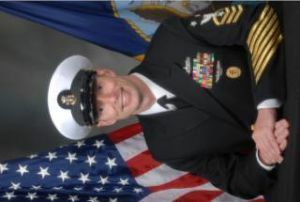 He is the father of two, Steven also serving in the Navy and a daughter, Lauren. He also has one granddaughter. Magnetta has been awarded many medals and awards in his 24 years of service to our country. Some of those are Meritorious Service Medal, Navy Marine Corp Achievement Medal (5) for heroism, National Defense Service Award, Armed Forces Expeditionary Medal, GWOT Expeditionary Medal and Armed Forces Service Medal. As Command Master Chief of the USS McCampbell, he is the highest ranking enlisted man on the ship. He is currently serving in Japan. According to Hometown Hero Project Chair, Sherry Ridge, “Joyce shared that he really misses Dunkin Donuts coffee.” With the help of Dr. Ben Martindale, Magnetta’s Hanging with the Heroes care package will be filled with Dunkin Donuts Coffee, pictures of Exchangites, snacks, treats and of course a piece of home.” All “Hanging with the Heroes” care packages are delivered with a personalized “Hanging with the Heroes” t-shirt (donated by Artrageous of Hainesville), and letters from Round Lake Area School District 116 students. Also starting this month the cost of mailing out the care packages will covered from a donation to the Hometown Hero project made by Avon Township.